I originally wrote this post in January of 2010. Every single word that I wrote then is still true now and I thought I would share. I took this photo at work last week. This is the barn outside of our gate, visible from our office. It has been leaning for years, then last Wednesday the wind picked up and it blew over. Even in this stage, it is beautiful. As soon as I knew it had fallen, all I wanted to do was go take photos of it. 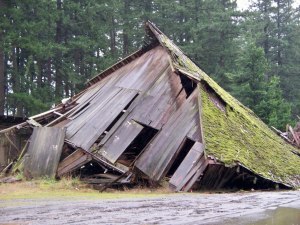 Judging from the condition the barn has been in for years with no attention, I think the owners of the property (if they are even still around) will let it go back to the earth. I am looking forward to documenting that process as well. The barn could have been saved. With a bit of basic care and maintenance. It wouldn’t last forever, but it could have had many more years. We are like that… our relationships are like that. Me, on the cusp of divorce talking about how a relationship could have been saved with care and maintenance? Yep. My marriage is no exception. It certainly could have been saved. But that would not have been the best choice for either of us. Bouncing around a bit here… good relationships deserve care and maintenance. Nurture them. Relationships that are innately against your grain need to be weeded out. If it is sucking you dry, and giving nothing back, changes need to be made. It’s as simple as that. Now, whether you then maintain and care for them or weed them out is for your soul to decide. But all relationships deserve one or the other. Nurture or weed. I have had a handful of good “girlfriends” in my life. The Air Force “weather wives” when I lived in Idaho… my friend Michelle in Alaska. Aside from that, I stick to myself. However, now, I have an amazing group of women friends online. My soul sister, a hemp artist who is branching out; A, the most amazing photographer I know; K, a baker with lots of hidden talents; so many more. And yesterday we were brainstorming. Tossing around ideas. Helping one another out. Filling one another’s wells. It was amazing. Yesterday this group and I decided to nurture. About weeding though… perhaps it’s painful. But if your motives are pure and you are taking all into consideration, then by all means weed. That doesn’t mean get a flame thrower out and destroy all in your path. It means gently remove the part (the person, group, etc) that isn’t working. Be very careful to honor them at the same time. Do no harm. It is not easy, trust me I would know. I’m sure I’ll write more about this topic as I move through it completely. For today… just think about it as you run across people. Nurture or weed.